You re invited to join a small group day trip from Kapiti to Whanganui. On arrival, we'll be treated to a two hour river cruise on the iconic Waimarie Paddle Steamer. 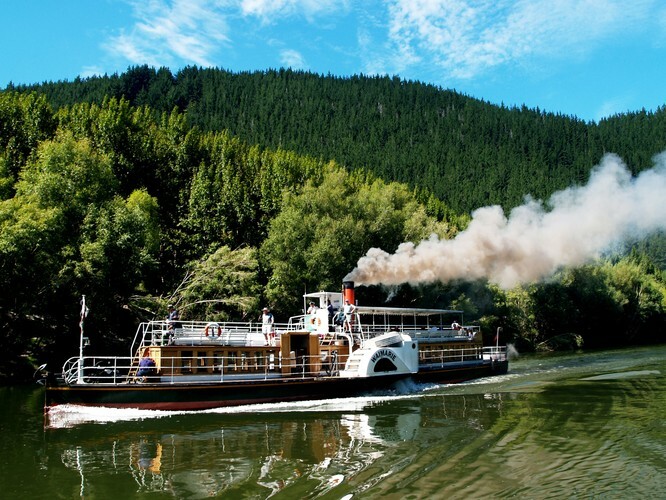 It's a great opportunity to experience New Zealand's only operational authentic coal-fired paddle steamer. While on board we'll learn about the fascinating history of the river and its surroundings. We'll also learn about the salvage and conservation of the beautiful Waimarie. After the river cruise we'll have afternoon tea at picturesque Lake Virginia, and if time permits we'll have a short retail stop in the city centre. This includes return minibus transport from Kapiti to Whanganui, a 2-hour river cruise, and afternoon tea at Lake Virginia. Please note that the light lunch options on board the Waimarie are an additional expense. Pick up points are: Paekakariki Village, Paraparaumu and Waikanae Railway Stations and selected Retirement Villages. ​Accessibility: The road trip is taken in a comfortable 12-seater mini-bus which is not wheel-chair accessible. Assistance is offered for mounting and dismounting the vehicle. Walking frames can be safely stowed in transit. The river cruise is taken in a historic paddle steamer which has narrow passageways and some steep stairs. Please talk to us if you are concerned about accessibility.